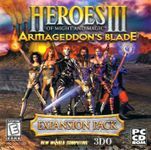 "Heroes of Might and Magic III: Armageddon's Blade is the first of two expansion packs for the turn-based strategy game Heroes of Might and Magic III. It was developed by New World Computing for Microsoft Windows and released by the 3DO Company in 1999. Only one of the six new campaigns available in Armageddon's Blade directly concerns the main storyline. The events of Armageddon's Blade immediately follow the events of Might and Magic VII: For Blood and Honor. As the kingdom of Erathia struggles to rebuild following the Restoration Wars, the Kreegans of Eeofol launch a surprise invasion. Already war-weary, the forces of Queen Catherine are no match for the formidable Kreegan army." Source: Wikipedia, "Heroes_of_Might_and_Magic_III:_Armageddon's_Blade," available under the CC-BY-SA License.